Aloha condos were great! The bed was comfortable, kitchen well stocked and clean. Only issue in warmer months is no a/c. Managers on property were great! If you want to hear the ocean from your bedroom window this is the place! Condo was exactly as advertised - completely satisfied! Step out the door to be poolside, then steps to the ocean. Place had everything we needed, and is in great condition. Say hi to Joe Webb, the property manager and an extremely helpful guy.Two couples stayed there for 5 days - we highly recommend this rental! What a wonderful experience. Joe maintains all the grounds and he is excellent at his job. Friendly and willing to give you tips of places to visit that aren’t in the regular tour books. Condos right on the ocean with sea turtles that seem to call the area home. These condos are comparable to the higher priced units you’ll find in nearby Kaanapali. Conveniently located to a number of beaches a short walk or drive away. Walking distance to a full service grocery store. Would definitely stay here again. This is our 5th time staying in this condo. We really like the closeness to the pool and water. My mother is 87 and this location is perfect for her. There have been some upgrades in the years we have stayed and much appreciated. The beds are comfortable but could use better pillows.The sound of the waves and the sunsets with views to Molokai are wonderful.If you are istaying over a Sunday, I would urge you to attend the little church next to the market. The service is in Hawaiian and English and the most friendly of any church I have attended. Had a great time , as always. Already have reservations for next year. We stayed for 8 nights and enjoyed the condo very much. It was well eqipped and the view was gorgeous. Being right on the beach was a delight and we saw many sea turtles. The pool was very well kept. The location was excellent. Sherry and Joe were very friendly and helpful with any questions we had. The only downside was there was no air conditioning although ceiling fans in all rooms helped. My kids and I stayed in this condo for our first trip to Maui. It was perfect! We couldn't ask for a better place to stay! Turtles were everywhere and would literally swim right next to you. The snorkeling was just like sticking your head in an aquarium and you only had to walk about a foot out from the shore! Store, coffee shop and snorkel rental shop were in walking distance. We will be back for sure next year! Hope you keep your prices affordable for more families to come and stay and make some great memories too! Mahalo! We visited this delightful place with our extended family. We swam in the pool, walked on the beach, snorkeled with the turtles, took in the sun and used it as a base for exploring Maui from one end to the other. It was perfect. We started with everything we needed. Added and replenished supplies as they were used up. Cooked, slept, washed, read, dreamed and just laid back with a cool drink and watched the sunset. Sherry, the manager was a delight to talk to, visit with and explore her gardens and plantings. Joe, the on-site manager kept the pool area meticulous and the whole place well taken care of. Everything you need from drinks to t-shirts, rental equipment to organic coffee, fruit and food to shampoo is within walking distance, including a nice community beach park. A short drive gets you to Maui Brewing Company or the sights and excursions in Lahaina. Spend a day and drive to Hana, Haleakala or many other sights and return to Nohonani for resting and recuperating. Don't miss it ! Perfect! The condo was great...it had all we could wish for and so did Maui! I can still hear the surf....at least that's what I keep telling myself! LOL Would love to stay again in the future! 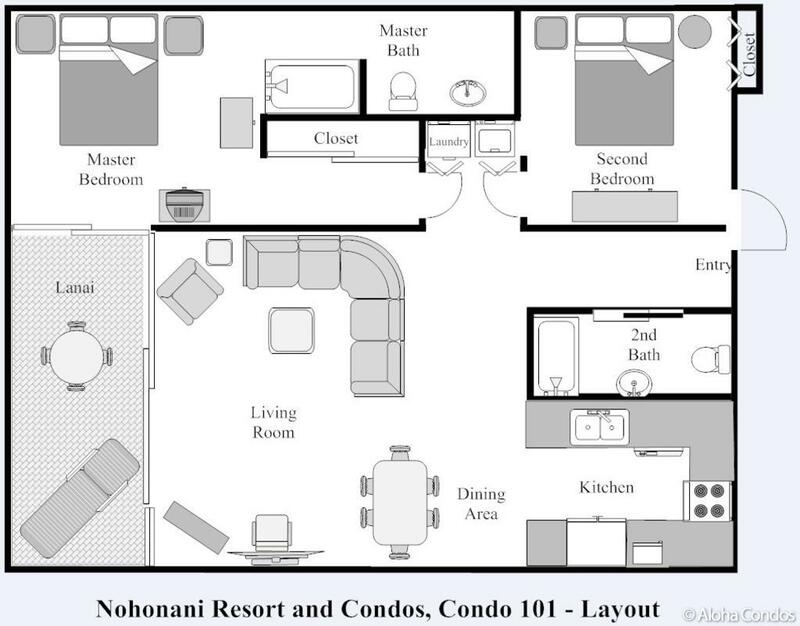 Thank you Nohanani Condos! Once again a wonderful stay atNohonani. We try to return each year to this lovely part of Maui! So sorry to hear of Evie's passing. She and Herb are still a part of condo 101! Mahalo. Great condo~right by pool and ocean~convenient to shopping, restaurants and beautiful views! My best friend of 67 years and I spent a week in Maui to celebrate turning 70. We couldn't have picked a better condo for its proximity to the ocean and its convenient location. The pool is right outside the lanai which was great after a large group of people left who kind of "took over" the area. After their "departure" we almost had the pool to ourselves. And the ocean is just a few short steps away. Every night we had the most glorious sunsets. On Sunday morning we went to the little Hawaiian church down the road. What a beautiful experience. The people were so gracious. The songs were in Hawaiian as was part of the service. It truly started our week off in a wonderful way. Right next door to the church was a Farmer's Market. We stocked up on the most delicious items. One of our favorites was the coconut tapioca. The condo is in a very convenient location ~ close to the grocery store, restaurants, shopping. The pool and area is kept very clean. The condo had two bedrooms and baths which was great for us. It was so nice to fall asleep at night listening to the ocean waves. We will definitely stay there again when we return to Maui. The only suggestion I have is that they get another fan for the condo. Sometimes it got a little warm and the fan would help circulate the air. All in all, it was a great experience! Had a great time, Condo was nice and clean,the condo felt like home away from home, nice and cozy. Every morning my Grandkids enjoyed the beach, snorkling, swiming, the pool was never used, beach was right out side PERFECT, we plan to go back in the summer with all the family. we would like the same condo. Thank you so much. Resort is perfect. Have been returning for over 20 years. Aloha Condos staff is top rate. Would definitely stay here again!!! The location of this condo is amazing. The first floor access right to the pool and beach couldn't be better. It was the perfect size for two couples. Very quiet and relaxing. Having private beach access with chairs and loungers was such a bonus. Great view of Molokai and Lanai and the sunsets can't be beat. The only reason we didn't give it a 5 is that we had to purchase our own dishwasher soap, not enough silverware(only 4 spoons), 4 more beach towels would have been nice.Could also use a new refrigerator. Although the freezer worked really well, the fridge did not keep things very cold, even though it was turned up. Also, since there is no air conditioning, it would have been nice to be able to lock the screen door at the front. This would have allowed us to keep a breeze flowing through the condo, while we were at the beach. Didn't feel comfortable leaving it open when no one was inside. Overall, we had a wonderful time and would definitely return. This condo had the bes view right outside the back patio door. The sunset was perfect. The rooms were comfortable and the location was close to everything necessary. I will definitely come back. Great memories. Our stay at Nohonani Condo 101 was wonderful. We loved walking out the door to the pool and beach. The giant turtles were swimming right there near us and would come up on the beach almost daily. The condo was well equipped and had everything we needed for a perfect vacation. We can't wait to go back. This was our third time to stay at Nohonani 101 and we really love the hominess, the great location and the neighbors - sea born and human!We are scheduled for next year as well! Had a great time as always. Unit could use more silverware, mainly dinner forks, and the land line phone did not work. Otherwise, everything was wonderful and unit was great. Aloha!!! Great location. Nice condo unit but it could really use a thorough cleaning. Caretaker is friendly and helpful. The pool is small but nice and clean. Beautiful property, great views, although there was construction going on the whole time we were there the on site Manager Joe was polite and on it the entire time. The convenience of close shopping, rentals and pizza made it all worth it. This was our second time in this unit which is the perfect place for my 85 year old mother.The pool is just steps away from the lanai and the ocean just another few steps. The condo has everything you need for a carefree vacation. The farmers market is within walking distance and there is a lovely church next to the market that is very inviting and welcoming with the singing done in Hawaiian.The property is quiet and the views to Molokai and Lanai are viewed from the condo. We will be back for a third time. My husband and I rented this two bedroom condo with another couple. We were very comfortable and the location is great. There are many shops in walking distance and just a short drive into old Lahaina. Yet this is a small facility that never seems crowded. Often we had the pool to ourselves. The pool is steps away, and a great little beach just a few steps from the pool. Turtles are often swimming or lounging on the beach. I booked this online and was very happy upon arrival. Everything we needed was there and dinner on the lanai provides some of the most beautiful sunsets you will ever see. I highly recommend this condo if you are looking to stay in Maui. When we arrived, the condo was cool and airy and clean. It was very comfortable, and even though it is located only yards from the pool and gathering area, it was private and supportive. The location is perfect being just minutes away from groceries, great food, and more lovely beaches. We often went to Lahaina to Safeway and enjoyed Front street shops and especially Kimo's restaurant, and further north on our street is Miso Phat, with the best sushi we have had in a long time, made delightful by the sushi chefs and the joyful atmosphere! And Joe, the caretaker is great! Wonderful proximity to the sand, water and pool. Travelling with small children, it was nice to have a park and stores close by. We have no complaints about the unit itself, the rental process, or the location. We had no issues with noise levels either, as others have mentioned. The resident manager is very nice. This two bedroom condo was perfect for my 83 year old mom and me. It was 30 feet from the sand and 8 feet from the pool. We found that no one showed up to the pool until around noon and were gone again at sunset so we had the area all to ourselves with a killer view. Turtles were on the rocks in front all day and slept on the sand. The condo was comfortable and had good Wifi and television. We loved the comfy couch and the guest bath had grab bars for the toilet. The Farmers Market was a nice short walk away and we attended the church next to it which was in Hawaiian. Loved it! Everything was clean and perfect for us. We will probably be back next year. Swim with turtles, great snorkeling, very friendly staff and other renters. Excellent place to stay. Loved this condo, location, simplicity, cleanliness and just the lovely beach in front. Everything was just what I was looking for, for my trip to Maui. Peace and relaxation. The condo has been updated with granite countertops and tile flooring and a lovely tile walk in shower. The simplicity of the furniture and décor was just right. Love the turtles out front everyday and all the sea life to view from the beach. Can't say enough good about this place! While this condo has an excellent location, since it is on the first floor right next to the pool it was very noisy from 9:00-9:00 every day. If you have kids who want to spend all day at the pool, this is a good choice for you. Probably not a good choice if you want some peace and quiet when you are in the condo. Reviewed by A Wonderful Vacation! We loved that we were steps away from the ocean. Listening to the waves hit the shoreline every night was wonderful. Condo was very spacious and had everything that we needed. Every nite a huge Hawaiian Sea Turtle came up on the beach right in front to rest. Just magical! It is a little noisey if you go to bed early due to the fact that it also is poolside. But the resident manager kicked all the kids out at 9:00 every night. I know that's not late but when you're out in the sun and doing activities all day ... Well lets just say we never saw 10 pm any night! We rented 3 ground floor condos as we had a large group. The location was chosen because of proximity to our vow renewal ceremony on Kapalua Beach. The condo beach is very small and not as kid friendly as I would have liked, but the children loved the pool! We all enjoyed the sea turtles that swam off shore and slept on the beach. The facility manager Joe, was very warm and inviting. The condo itself was very comfortable and roomy. Wow what a great place with its own beach only steps away from your living room. Condo was nicely furnished and had everything you need for an extended stay. Patio and pool were fantastic and the gas grill was an extra bonus. Almost made you feel guilty leaving it to explore the island. Would definetly recomend this to my friends and am sure we will be back there on our next Maui trip. While we are not huge fans of West Maui, this condo, located north of Lahania offered amazing beach access only a few steps from our own private lanai!! I imagine during whale season the location is perfectly situated with Molokai'i in plain sight across the channel for whale watching. We recommend this condo for anyone looking for a quiet vacation rental or honeymooners (like us). Sun, sunsets, a pool, turtles(including the ones in the pool)snorkeling, and a beach just steps from your front door. What else do you want when looking to get away from it all. The service was good and the condo was clean and comfortable. We had a great time in this condo. If you are looking for a private quiet condo but still close to everything. We had turtles every day on the reef in front and even caught pictures of one sleeping on the sand. Being able to just walk right out to the pool and sandy beach was fabulous. Great place for family with kids. We loved our stay at Condo 101. It is an oceanfront unit. We used to have our morning tea at sunrise on the beach, and evening tea watching the sun set into the ocean.The kids had a fun time at the little 'private' beach when we were at home. We spotted a sea turtle at this beach and were also able to snorkel there and see fishes.The unit is equipped with full kitchen, dish washer and washer-dryer which proved very useful. The condo is located in a great part of Maui The condo provided all that was needed for a great vacation.